Found 141 file extension associations related to TI Connect and 140 file formats developed specifically for use with TI Connect. TI Connect software is the new-generation link software, which takes TI calculator technology to a new level of calculator, computer and Internet connectivity. Downloading and transferring data, Operating System (OS) updates, Calculator Software Applications (Apps), and programs are easier than ever before. No more worrying about downloading the TI-GRAPH LINK™ software for each type of TI calculator. 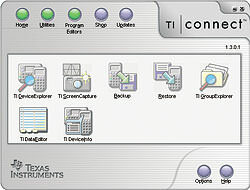 TI Connect software is a universal application that is compatible with many calculators.